Tired of the same old tourist traps? Whether you’re a visitor or a local looking for something different, Oklahoma Off the Beaten Path shows you the Sooner State you never knew existed. Catch a reenactment of an historic Wild West show at Pawnee Bill Buffalo Ranch, stroll through the collection of bonsai trees and Japanese-style cascading pools at Lendonwood Gardens, or admire the rose-colored fossilized crystals at the Timberlake Rose Rock Museum. So if you’ve “been there, done that” one too many times, get off the main road and venture Off the Beaten Path. 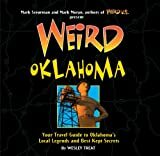 Tourists looking to avoid the same old sights will love this unique guide to the Sooner State. The places found in this restaurant guide are the most positively reviewed and recommended by locals and travelers. (Cuisine Types): American, Asian Fusion, Brazilian, Cajun/Creole, Caribbean, Chinese, Cuban, Ethiopian, Filipino, French, German, Gluten-Free, Greek, Halal, Honduran, Indian, Italian, Izakaya, Japanese, Korean, Laotian, Latin American, Mediterranean, Mexican, Middle Eastern, Moroccan, Pakistani, Persian/Iranian, Peruvian, Ramen, Salvadoran, Spanish, Szechuan, Tex-Mex, Thai, Turkish, Vietnamese and many more options to visit and enjoy your stay. Make bird watching in Oklahoma even more enjoyable! With Stan Tekiela's famous field guide, bird identification is simple and informative. There's no need to look through dozens of photos of birds that don't live in Oklahoma. This book features 115 species of Oklahoma birds, organized by color for ease of use. Do you see a yellow bird and don't know what it is? Go to the yellow section to find out. Fact-filled information, a compare feature, range maps and detailed photographs help to ensure that you positively identify the birds that you see. Compact guide to 105 of the most common or notable birds found in Oklahoma, at such sites as Black Mesa and Beaver's Bend State Parks, the National Wildlife Refuges at Sequoyah, Salt Plains, Wichita Mountains, and the Tallgrass Prairie National Preserve. Each bird is presented with beautiful full-color illustrations and comprehensive notes on habitat, nest and eggs, feeding and voice, and differentiation from similar birds. Over 500 color illustrations, 105 range maps, index, and checklist. With its Rocky Mountain foothills, hardwood forests, many rivers and streams, low mountains, sand dunes, cypress swamps, and wide swaths of rangeland and pastureland, the Great Plains state of Oklahoma is one of only four with more than ten ecoregions. Tallgrass, mixed-grass, and shortgrass prairies are native to large areas; rainfall and temperature are quite variable; and elevations drop from 5,000 to 300 feet. This diversity ensures that Oklahoma is host to hundreds of species of wildflowers, yet no guidebook to these botanical riches has been available in recent years. Patricia Folley’s beautifully photographed and carefully compiled Guide to Oklahoma Wildflowers fills this gap. Oklahoma contains vast plains, elevated rocky plateaus, and forested mountains. Botanizing one’s way across the Sooner State reveals celestial lilies in the east, prickly poppies in the west, Dutchman’s breeches in the northeast, large-flowered evening primrose in central and southwest areas, Indian pink in the southeast, walking-stick cholla in the Panhandle, and purple prairie clover statewide. Gardeners, teachers, tourists, and naturalists of all levels of expertise will enjoy this guide’s concise text and vibrant photos. Get the test prep help you need to be successful on the OGET test. The OGET (074) Exam is extremely challenging and thorough test preparation is essential for success. OGET Exam Secrets Study Guide is the ideal prep solution for anyone who wants to pass the OGET Exam. Not only does it provide a comprehensive guide to the OGET Exam as a whole, it also provides practice test questions as well as detailed explanations of each answer. It's filled with the critical information you'll need in order to do well on the test the concepts, procedures, principles, and vocabulary that the Oklahoma Commission for Teacher Preparation (OCTP) expects you to have mastered before sitting for the exam. These sections are full of specific and detailed information that will be key to passing the OGET Exam. Concepts and principles aren't simply named or described in passing, but are explained in detail. The guide is laid out in a logical and organized fashion so that one section naturally flows from the one preceding it. Because it's written with an eye for both technical accuracy and accessibility, you will not have to worry about getting lost in dense academic language. Any test prep guide is only as good as its practice questions and answers, and that's another area where our guide stands out. Our test designers have provided scores of test questions that will prepare you for what to expect on the actual OGET Exam. Each answer is explained in depth, in order to make the principles and reasoning behind it crystal clear. We've helped thousands of people pass standardized tests and achieve their education and career goals. We've done this by setting high standards for our test preparation guides, and our OGET Exam Secrets Study Guide is no exception. It's an excellent investment in your future. Oklahoma has a history that's both notorious and peculiar, from legendary natives like Giggling Granny-a jovial woman responsible for as many as eleven murders-to Shaman's Portal, a gateway said to have swallowed handfuls of unsuspecting travelers over the last few centuries. And keep your camera at the ready for shape-shifting manimals”! On this tour of the Sooner State, you'll encounter the outlandish, exceptional, and bizarre.